This walkthrough demonstrates how to add localization support to a WCF RIA Services business application. Today, many business applications need to be used by people in various parts of the world. Silverlight, ASP.NET, and WCF RIA Services include support for applications localized for a particular culture or locale. In this walkthrough, you will write an application that can load user interface strings written in either English or Canadian French, depending on the value of the language setting in the browser. Configuring the client project to support specific languages. Configuring the test page to use localized resources. Configuring Internet Explorer to load a localized page. Adding support for bi-directional languages. This and the other walkthroughs presented in the WCF RIA Services documentation require several prerequisite programs, such as Visual Studio 2010 and the Silverlight Runtime and SDK, be installed and configured properly, in addition to WCF RIA Services and the WCF RIA Services Toolkit. They also require installing and configuring SQL Server 2008 R2 Express with Advanced Services and installing the AdventureWorks OLTP and LT database. The following procedure shows how to specify supported languages in the client project file. Select the Silverlight Business Application template from Silverlight group of the Installed Templates and name the new project LocalizedBusinessApp. In Solution Explorer, right-click the client project (LocalizedBusinessApp), and then click Unload Project. Right-click the client project again and then click Edit LocalizedBusinessApp.vbproj or Edit LocalizedBusinessApp.csproj. The project file opens in the designer. Find the SupportedCultures element and add the culture code for French (Canada) [fr-CA]. Use either a comma or a semi-colon to delimit the culture codes. In Solution Explorer, right-click the client project and then click Reload Project. The project is reloaded into Solution Explorer. Adding support to your application for an additional language involves essentially, creating copies of existing resource files, renaming the copied files, and then translating the strings in the newly copied resource files. The following procedures show how to localize the resources in the server and client projects. In the Solution Explorer, in the server project (LocalizedBusinessApp.Web), expand the Resources folder. Right-click the RegistrationDataResources.resx file and then click Copy. Right-click the Resources folder and then click Paste. Rename Copy of RegistrationDataResources.resx to RegistrationDataResources.fr-CA.resx. The culture code must be included in the file name to correctly establish that the resource belongs to that culture. Similarly, copy the ValidationErrorResources.resx file and rename it to ValidationErrorResources.fr-CA.resx. 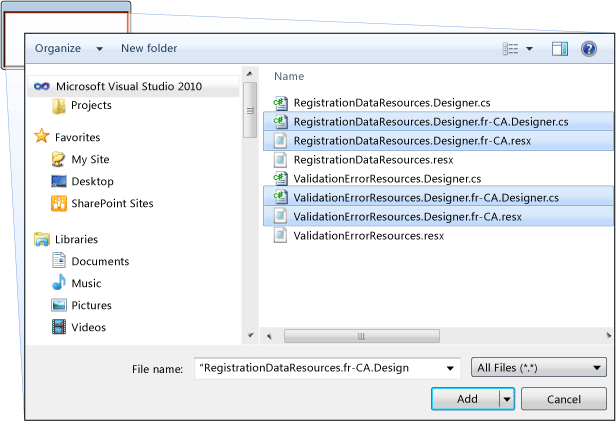 Double-click RegistrationDataResources.fr-CA.resx to open it in the Resource Designer. Replace the English values and comments with French equivalents, as shown in the following table. The Comment strings are typically used for tool tips. Comment voulez-vous que votre nom être affiché dans l'application? This walkthrough does not localize all of the strings. 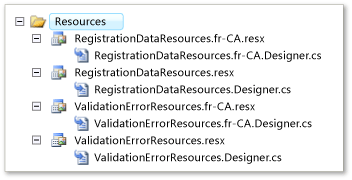 To complete the localization for the server resources, you would also localize ValidationErrorResources.fr-CA.resx. In the client project, expand the Web folder and then expand Resources. Right-click the Resources folder, click Add, and then click Existing Item. Navigate to the LocalizedBusinessApp.Web\Resources folder. Click the down arrow on the Add button and then click Add As Link. The localized files are added as links in the client project. In the client project, expand the Assets folder and then expand Resources. 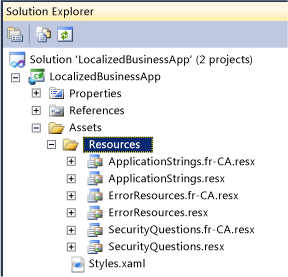 Create a copy of ApplicationStrings.resx and rename it to ApplicationStrings.fr-CA.resx. Create a copy of ErrorResources.resx and rename it to ErrorResources.fr-CA.resx. Create a copy of SecurityQuestions.resx and rename it to SecurityQuestions.fr-CA.resx. Open ApplicationStrings.fr-CA.resx in the Resource Designer. To complete the localization for the client resources, you would also localize ErrorResources.fr-CA.resx and SecurityQuestions.fr-CA.resx. The following procedure shows how to specify culture information in the test page. In the server project, open LocalizedBusinessAppTestPage.aspx in Source view. The client application is now ready to show either of its two different versions. To view the Canadian French version, you must configure your Web browser to use Canadian French as its default language. The following procedure describes how to configure Internet Explorer. Press F5 to run the solution. The application starts in Internet Explorer. 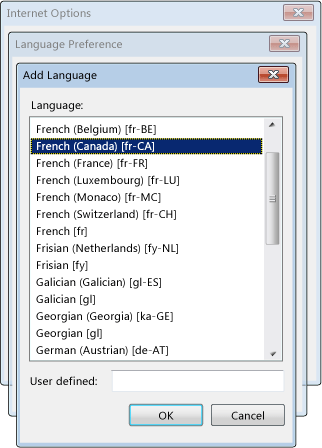 Unless the language preference in Internet Explorer is already set to French Canada, the strings appear in English. Click the Tools menu and then click Internet Options. On the General tab, click Languages. The Language Preference dialog box appears. Select French (Canada) [fr-CA] and then click OK. 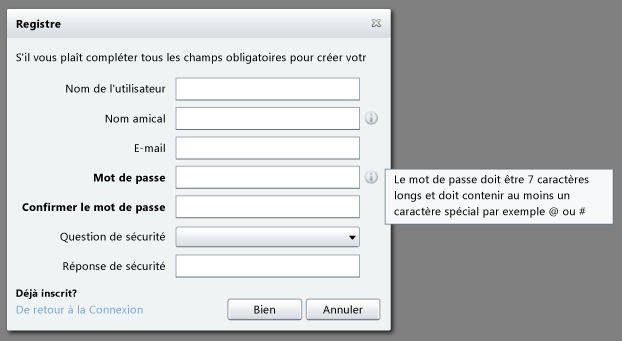 In the Language Preferences dialog box, move the French language to the top of the list. Click OK two times to close the dialog boxes. The pages should now appear in French. Notice that the Login dialog box is in French. To add support for a bi-directional language to a Silverlight Business Application, you would follow the previous steps, substituting the locale code shown for the bi-directional language of your choice. In addition, you would need to specify the flow direction, as shown in the following procedure. In each resource file that contains bi-directional language strings, add a new row with a Name of FlowDirection and a Value of RightToLeft. In the root element of each XAML window that you want to implement bi-directional language, add a FlowDirection attribute. Bind the FlowDirection attribute value to the value added to the resource file, as shown in the following example.